Michelle Lujan Grisham speaks with students. Gov. Michelle Lujan Grisham is proposing $60 million more this year for early childhood education — part of a five-year plan to make access to preschool in New Mexico available to all 3- and 4-year-olds. Legislation has been introduced that expands the prekindergarten program in public schools and adds preschool classrooms to the school building fund. With a $1.1 billion surplus to ease financial pressures, both the governor and Legislature are proposing a huge boost in dollars meant for public schools. Given all that, does it still make sense to pursue the long-fought goal to tap the $17.5 billion Land Grant Permanent Fund to help pay for early childhood education in New Mexico? The governor, for one, says yes. “I have every intention of having the fight of my life on this issue,” Lujan Grisham told New Mexico In Depth. Democratic Rep. Javier Martinez is c0-sponsoring a plan to use money from the Land Grant fund to help pay for early childhood education. 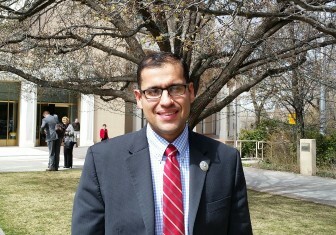 Sponsors Rep. Moe Maestas and Javier Martinez, Albuquerque Democrats, took their constitutional amendment to the House Education Committee on Wednesday, where the proposal to generate about $133 million to $144 million annually for early childhood services by taking an additional 1 percent from the school endowment fund passed on a party-line vote of 10-4. If the measure passes the Legislature, it would be placed on the ballot in November 2020 for voters to decide. “In all the years to be pushing this, it is interesting to me that it is being promoted in a year when we have a surplus,” said Rep. Rebecca Dow, R-Truth or Consequences, who runs a nonprofit child-care business in Sierra County. She voted against the proposal. She has issues both with the idea of drawing down the public schools endowment and expanding preschool and early childhood services when there are problems with existing efforts. The Legislative Finance Committee has documented that New Mexico’s PreK program is taking children from Head Start, a federally funded program to help low-income children. That means New Mexico taxpayers pay for preschool with limited tax dollars while sending money back to the federal government. And other programs, such as home visiting, can’t fill up all the slots with the money they have. Dow is backing other early childhood initiatives such as expanding access to child-care assistance for low-income working families and a bill by Maestas that would create a child and family database. It would collect data from multiple state agencies to study which programs are working, and which are not, so the state can make more informed choices on where to spend. But Martinez said he’s tired of the same arguments being used to put off the chance to fully fund early childhood initiatives. It was a palpable sentiment in the room among legislators who voted for the plan, which has been proposed since 2011. Martinez believes 2019 is the year the proposal will get a full hearing in the Senate, where it is likely to face strong opposition from conservative lawmakers from both parties. He said the landmark court ruling puts pressure on the state to improve educational outcomes for at-risk students and specifically mentions early childhood programs. Lujan Grisham’s backing and goal to make a “moonshot for education” also help to change the calculus, he said. Martinez also is a member of the House Taxation and Revenue Department, where a conversation about tax reform is underway. This year’s $1.1 billion surplus comes mostly from the oil and gas industry, and that revenue is unpredictable. The fluctuations have led to booms and busts — along with cuts to education and other state services in lean years. Democrats are arguing for widening the tax base so the state is less reliant on oil and gas for its budget. The money from the fund would be used to create a stable funding base for early childhood education, Martinez argues. It’s an argument that Lujan Grisham is making as well. She understands conservative lawmakers’ hesitation to tap into the school fund when the state’s revenue can be volatile, she said, especially when some lawmakers and advocates look at the Land Grant fund as a giant piggy bank for a range of projects. She wants to allay their fears. Diversifying the economy and tax base are crucial, as is being responsible about how much to take out of the fund so that it can continue to support New Mexico’s public schools, she said. These days, Yazzie feels pride in speaking Navajo and wants the same for her children when they grow up. “That would be one of the great accomplishments, if we get (Native language classes) in all the schools,” Yazzie said a few weeks ago to talk about a historic ruling in a lawsuit that bears her name.